Shake HydraGuard well before use. Do not dilute. Not for use on wood, plastic, glass, clothes, carpet, or metal. Do not mix with bleach. This product has a milky appearance, which turns clear on drying. Protect from freezing. Works for interior and exterior high use areas. STOP AND READ Before applying HydraGuard, surfaces should be clean, dry, and free of oil, wax, dust, and all efflorescence. If grout is present, allow grout to cure for at least 24 hours prior to application. If you are unsure about your preparation procedures prior to using HydraGuard, then contact us immediately for instructions or call 877-561-4262. We offer testing services and aquaTIGHT® EFX, Efflorescence Prep, Seal & Wash for washing blue stone, sand stone, limestone and other natural stone where thinset, mortar and grout has been installed. Grouting and mortar application leaves behind the ingredients necessary to help aid in the promotion of efflorescence. This product kit will help to mitigate existing salt formation and allow it to sequester while sealing. To learn more about Efflorescence, visit our FAQ page the efflorescence page itself. All natural stone surfaces cleaned with muriatic acid, sulfamic acid or bleach will have to be washed first with aquaTIGHT® EFX, Efflorescence Prep, Seal & Wash prior to applying HydraGuard. The above cleaner choices promote the growth of efflorescence. If set accelerators, such as calcium chloride, were added to the mortar mix, then we recommend aquaTIGHT® EFX, Efflorescence Prep, Seal & Wash prior to applying HydraGuard. Thoroughly wet the surfaces with HydraGuard using a rag, sponge, roller or brush to achieve 100 percent surface coverage. Allow to air dry for at least 10 minutes or until the surface appears to be completely dry. Test the surface with water droplets. If water penetrates, repeat steps 2 through 4 until water beads. Clean tools by washing with water. Wash exposed skin with soap and water. Surfaces may be walked on after one hour without hindering performance. Before applying HydraGuard, surfaces should be clean, dry, and free of oil, wax, dust, and efflorescence. Thoroughly wet the surfaces with HydraGuard using a rag, sponge, roller, or brush to achieve 100 percent surface coverage. Before the surface dries, wipe it lightly with a rag or sponge to remove excess HydraGuard. Wait a minimum of 5 minutes before wiping. Begin grouting immediately after drying, following grout manufacturer’s installation instructions. When applied according to directions, aquaTIGHT® HydraGuard enhances the appearance of concrete, cement, stone, tile, and grout and renders these surfaces water repellent. Waterproof grout – what a great thing! If water repellency is insufficient or decreases over time, performance can be restored by reapplication of this product. CAUTION: Do not swallow. Avoid contact with eyes, skin, and mucous membranes. Do not inhale mist or vapors. Water resistant gloves should be worn while applying this product. If spraying, wear a dust mask to avoid inhalation of mist. Keep out of reach of children. If swallowed: Give plenty of water and call a physician immediately. Do not induce vomiting. EYES: If eye contact occurs, flush immediately with water for 15 minutes. SKIN CONTACT: Wash with soap and water. Clean up spills by soaking up liquid with absorbent rags and/or rinsing with water. Use in place of water for mixing grout, cement, or mortar. Do not dilute. Do not mix with bleach. Pour one full 72 fl. oz. (2.1 L) bottle of aquaTIGHT® grout additive into a clean, dry 5 gal. pail. Add 25 lb. (11.3 kg) of sanded grout to the additive. If additional liquid is required to achieve the desired consistency, up to a maximum of 2 fl. oz. (59 ml) of cool, clean water may be used. Recently weights of grout bags produced by multiple companies have been weighing more than what is printed on the bags as this picture illustrates. Our additive fluid levels are enough to handle UPTO and less than <25 lbs. Greater than >26 pounds will require my hydration to meet the water demand of the portland cement grout. Meeting the hydration demand is achieved by adding >2 and less than <5 ounces more water. Of course if you prefer a consistency you are familiar with then because the grout bags differ in weights adding distilled water is an option. We don’t recommend tap water because it varies from place to place and there is not telling what contaminants are in the tap water. Pour 49 fl. oz. (1.4 L) of aquaTIGHT® Additive into a clean, dry 5 gal. pail. Add 10 lb. (4.5 kg) of unsanded grout to the additive. If additional liquid is required to achieve the desired consistency, up to a maximum of 2 fl. oz. (59 ml) aquaTIGHT® Additive may be used. Mix to a stiff, lump free consistency using a low speed drill. If using a mechanical mixer, do not exceed 150 rpm & avoid whipping air into the mixture. Let it stand for 10 minutes to give all ingredients time to slake. Remix and use. Do not add more liquid or dry grout to the mix after slaking. Follow manufacturer’s instructions for grout installation. Install grout when temperature is above 50°F (10°C). For enhanced water beading, use aquaTIGHT® Additive instead of water for final grout cleaning. Protect from traffic for 24 hours and water immersion or freezing for seven days. Clean tools immediately by washing with water. Wash exposed skin with soap and water. When applied according to directions, aquaTIGHT® GA makes concrete, grout, and mortar water repellent without buildup of adherent surface films. 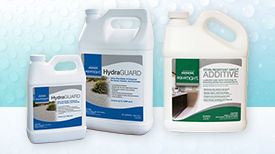 aquaTIGHT® GA is resistant to common household cleaners. If water repellency is insufficient or decreases over time, performance can be restored by application of aquaTIGHT® Stone, Brick, Concrete, Tile & Grout Sealer (aquaTIGHT® GS). WARNING! May cause eye and skin irritation. Harmful if swallowed. Wear properly fitted splash proof chemical safety goggles and face shield. In case of eye contact, immediately flush with plenty of water for at least 15 minutes. Wear suitable gloves and clothing. In case of skin contact, immediately rinse with plenty of water. Remove contaminated clothing and shoes. Wash clothing before reuse. Get prompt medical attention if irritation persists. A NIOSH approved filtering facepiece selected by a trained health and safety professional is recommended in poorly ventilated areas or when permissible exposure limits may be exceeded. If inhaled, it may cause respiratory tract irritation. Remove yourself to find fresh air. If not breathing, give artificial respiration. If breathing is difficult, give oxygen and get immediate medical attention. If swallowed, do NOT induce vomiting unless directed to do so by medical personnel. Get immediate medical attention. Never give anything by mouth to an unconscious person. WARNING: California proposition 65: This product does not contain a chemical known to the State of California to cause cancer, birth defects or other reproductive harm. KEEP OUT OF THE REACH OF CHILDREN AND ANIMALS. Refer to MSDS. Apply this sealant product after installation is complete and grout has cured for at least 24 hours. Test in an inconspicuous area first and evaluate for appearance. Do not dilute. Not for use on wood, plastic, glass, clothes, carpet, or metal. Do not mix with bleach. Before application of aquaTIGHT®, surfaces should be clean, dry, and free of oil, wax, and dust. Thoroughly wet the surfaces with aquaTIGHT®. Excess may be spread to adjacent areas with a rag, mop, brush, roller, or sponge. Before surfaces have dried, wipe lightly with a rag or sponge. Wait at least 5 minutes before wiping. Allow to air dry for at least 30 minutes or until the surface appears to be completely dry. If haze appears on any portion of the surface, reapply aquaTIGHT® GS on those locations, and immediately wipe to remove haze. Clean up tools by washing with water. Wash exposed skin with soap and water. When applied according to directions, aquaTIGHT® GS makes stone, ceramic, grout, cement, and concrete surfaces water repellent without buildup of adherent surface films. 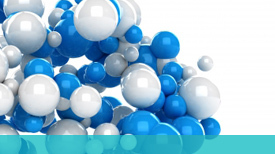 aquaTIGHT® GS is resistant to common household cleaners. If water repellency is insufficient or decreases over time, performance can be restored by reapplication of this product. If swallowed: Give plenty of water, and call a physician immediately. Please do not induce vomiting. EYES: If eye contact occurs, flush immediately with water for 15 minutes. SKIN CONTACT: Wash with soap and water. Clean up spills by soaking up liquid with absorbent rags and/or rinsing with water. Collected spill less than about five gallons may be disposed of by pouring down a drain.